Step 1 (ab0ve) … Start by drawing a vertical rectangle and divide it into 2 equal division horizontally. Step 2 (ab0ve) … Next is to draw a vertical line for the middle finger. Step 3 (ab0ve) … Having the middle finger as a guideline, create more slightly slanting vertical line for the rest of the fingers. It is always good to look at your own hand as a reference. Try to observe the height or length differences of each finger, the middle are most likely to be longer of all five fingers. When constructing, it is always better to think square. This helps massing out the guidelines more easier. 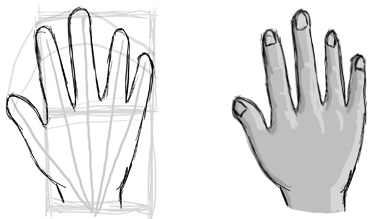 Make use of the guidelines as you begin to form the actual hand structure. See the pictures above for reference. 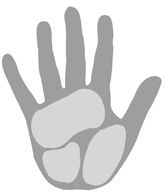 Try to observe your own fingers and see how each fingers may vary in size and width. The thumb is the thickest while the pinky (baby finger) is the thinnest. Be aware of this muscle group of the hand (palm). 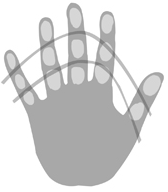 Following the curve lines reveals the alignment of each finger. 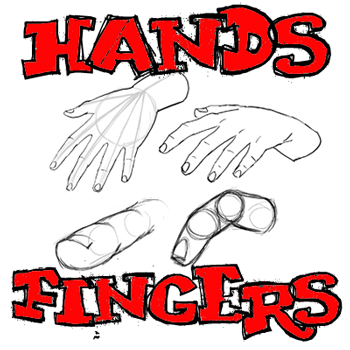 Another simple approach to constructing hands. And again with a different hand pose. Hand styles are affected greatly by gender and age. Considering these factors can make a difference to the hand. 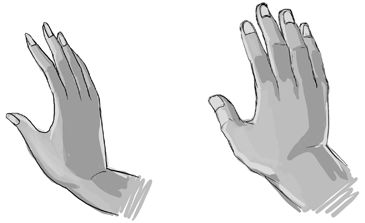 The example above shows the difference between a male (right) and female (left) hand. The distinction between male and female hands can be found in the manner of how it is being drawn. Since both hands have the same constructions method, outlining the hand properly can tell whether a hand belongs to a male or female. Looking at the illustration above, compare the two hands. On the left, it is most likely to be feminine and belongs to a female. One thing to notice is how the outline forms the hand. On female’s hand, it’s quite smaller, fingers thinner pointed, and nails longer. The manner of outlining the female hand is smoother and with less or without too much cornered edges as compared to a male hand. These are some characteristics of a female hand. Of all the feminine aspects of the female hand, male hands are completely the opposite. The outline has many cornered edges, showing the prominent muscles in the hand (what gives male hands bulk). This is most obvious on adult male hands. 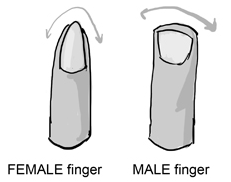 Some features of male hands include wider fingers, compared to female’s shorter and not pointed fingernails. Also, on male hands, veins are more likely to be exposed. Observe and try to experiment on these fingers. Notice the differences between the two, from the shape of the fingers to the fingernails. Try to imagine a cylinder when drawing fingers. This makes foreshortening easier. Out of all the tutorials on hands that I have found I think this one helped the most! You could add more in describing how long to make each of the figures, and add something about how to draw a hand sideways and give more positions. But besides that I think it’s really great! Thanks this is a good page but can you add more to it? I am not trying to make you feel bad! that didn’t help. I’ve tried all of the techniques but nothing. My hands still look like a freaky alien. A little too dramatic on the differences between the two hands from male to female. Very easy to get the length of the fingers wrong as well. I was actually looking for how to make the palm and the fingers look…real. I seriously did not find this tutor helpful, please update the instructions so that it is more detail in steps. i will try to follow the instructions in drawing manga… i hope it will help me improve my drawing skills so that i can draw better in the manga that i am working on…. this really helps me, . i wanted to draw magas, . i’m interested to this tutorials, . please send me messages about it, .,. i want to be upated.., please notify me, . thanks , . Thanks,I was having trouble drawing hands and feet.This helps me a lot!Thank you again. This did not help AT ALL!!!!!!!!!!!!! !